You. Me. Ride This Crazy Train - Adventures and Observations on The GO: So, here we are, two weeks into 30-minute service on the Lakeshore line and what's it been like so far? Glad you asked! Those seats coming "back" is a case of making a stink about nothing: those are the original bilevels in the 2000-2079 series that GO has always operated mixed in with the regular fleet. 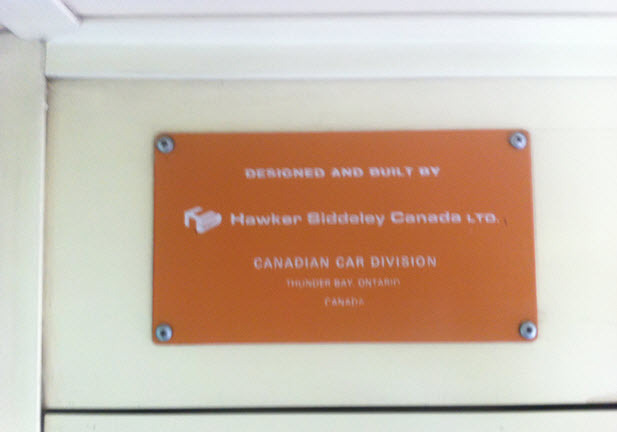 They operate on all lines, on all trains, like any other car. They will eventually be refurbished again when their time comes. Most of the other hundreds of cars GO has have the newer seat fabric, or will be getting it very shortly in the case of 24xx cars being refurbished. To be honest I don't really care on which train I get on. Old GO trains are still way better than the TTC and I'm enjoying not having to study my watch before I decide to head out to Union. My only complaint is that Durham transit hasn't follow suit and the few times I got to Whitby and Oshawa on those extra trains, there were no connecting buses. @RC: The same issue with connecting buses exists within GO Transit, e.g. Route 12. Back in April, the scheduling inconsistency was pointed to the Minister of Transportation, who quickly punted the query to Metrolinx, who promptly responded with “Buses will be adjusted in support of our new trains”, and then proceeded to do absolutely nothing about the matter. Is it just me or does go seem to be spearheading initiatives that nobody asked for. Quiet zones? Trains every 30 minutes when nobody rides them? Wouldn't their resources be better put into things that affect most riders? DRT probably won't add any more buses to match the new GO timetable. As it is, if you are taking a bus during Non-Rush-Hour, they are pretty much empty. Besides, they spent all the new fare increase (now 3.10) on introducing the 900 Pulse (aka the Kingston Rd. bus). I think this was a better use of their resources as it does seem to assist more people. At least the few times I rode it, it was PACKED. In essence, the new train times are good for only those who commute to stations with cars. "similarly, the last six WB trains from Oshawa are hourly 18:41 to 23:41 inclusive." Yeah, we found that out yesterday. Assumed there'd be a 6:57 from Danforth headed WB because, you know, 7pm on a Sunday evening isn't THAT late and lots of people head home from downtown at that time. At least we only had to wait 30 minutes, but I was a bit miffed they cut every 30 minute service so early. We're learning quickly that we can't count on the 'most off-peak trains are every 30 minutes' to cover when we typically travel. @Anonymous: You are quite right to challenge the motivation for Metrolinx’s business decisions. It’s still not clear to me how rebranding (new colour scheme for GO Transit equipment) will improve the level of service to passengers. My cynicism leads me to believe these initiatives are pure posturing in preparation for showcasing at the Pan Am Games in 2015. The new paint job on buses and trains will persist, but will we have “30-minute service” after the Games finish and the crowds have gone home? 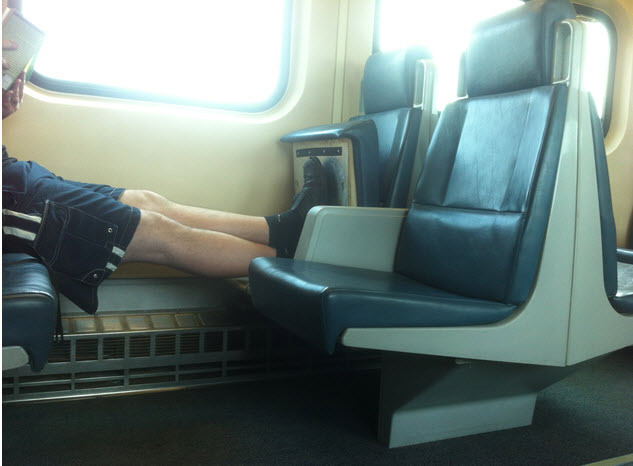 A little off topic, but the pic of the person with his/her feet up, with the actual seat cushion pushed up.